Last major update issued on February 10, 2010 at 05:35 UTC. The geomagnetic field was quiet on February 9. Solar wind speed ranged between 279 and 360 km/s. Solar flux measured at 20h UTC on 2.8 GHz was 91.4. The planetary A index was 3 (STAR Ap - based on the mean of three hour interval ap indices: 3.1). Three hour interval K indices: 10101201 (planetary), 01110111 (Boulder). 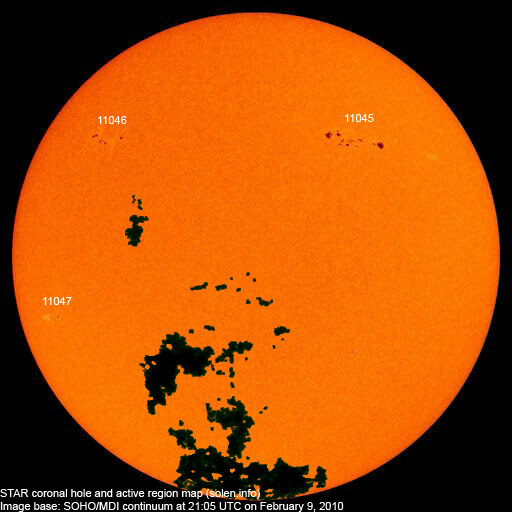 Region 11045 decayed further but could still produce occasional C flares. Region 11046 developed slowly and was quiet. 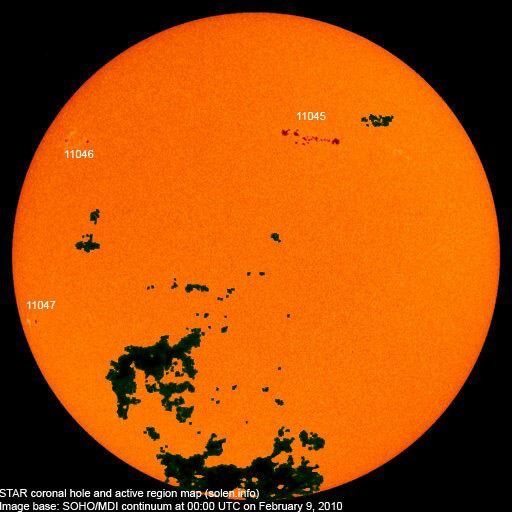 Region 11047 decayed and could soon become spotless. February 7: A full halo CME was observed following an M6 flare in region 11045. February 8: A small CME was observed after an M4 flare in region 11045. A recurrent coronal hole (CH390) in the northern hemisphere was in an Earth facing position on February 6-7. 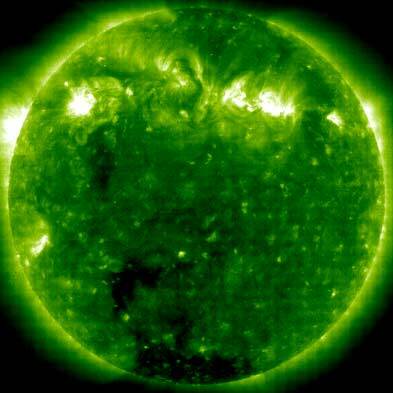 A coronal hole (CH391) in the southern hemisphere may have closed before reaching an Earth facing position. Processed SOHO/EIT 195 image at 23:36 UTC on February 9. The darkest areas on the solar disk are likely coronal holes. The geomagnetic field is expected to be quiet to active on February 10-11 due to CME and coronal hole effects.